Security is an important consideration for business owners. It can sometimes be easy to overlook that fact - many managing directors would rather focus on matters that are directly linked to the company's bottom line - but it remains a fact nonetheless. Business security, along with most other types of security, is like insurance: it's tempting to just go without, but by the time you realise just how much you needed it, it's too late. If you're keen to secure your business premises and protect yourself against crime, you'll be pleased to learn that everything you need to do so is available from a single source: IDS Security Systems Ltd. We provide comprehensive business security solutions to a wide range of clients, from micro-enterprises that operate out of a single room to huge government organisations and international corporations. Our offices are located in Llanishen, Cardiff, but we supply state-of-the-art security solutions to businesses all over Cardiff, South Wales, and parts of England (including Bristol and Gloucestershire). If you'd like to request a quotation for your business's security solution, call IDS Security on 029 20 753 251 or contact us online today. 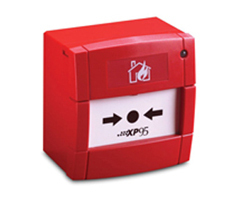 Addressable fire alarms are ideal for protecting large buildings from fire. IDS Security install addressable fire protection systems across England and Wales. Here at IDS Security Systems Ltd, we have helped countless clients to protect their businesses from fire. Our expert installers frequently carry out site visits in order to evaluate each client's requirements and recommend the best fire alarm system for them. Often, they judge an addressable fire alarm system to be the most suitable solution, particularly if the business in question spreads its operation across a large building. An addressable fire alarm system differs from a conventional system in that every device in the system (e.g. smoke detectors, call points) has its own unique 'address'. 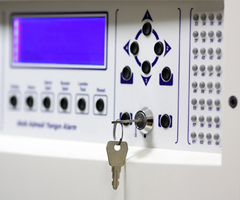 When one of the devices is activated, its address is displayed on the system's central control panel, making it much easier for the user to identify the location of the fire and tackle it before it spreads. The chief advantage of an addressable fire alarm system is the ability to immediately establish where on your premises a fire has broken out. Every second counts when a fire is burning, and knowing its location straight away will help you to minimise the damage. We especially recommend installing an addressable system if your site is very large and/or has several storeys, as is it not always immediately obvious which part of a large building might be on fire. Interestingly, one additional benefit of using an addressable system is a reduced likelihood of false alarms. Addressable devices monitor air flow in order to stop the alarm being raised unless there really is a fire; false alarms can be disruptive and costly for companies, and many of our clients have told us that they appreciate this added safeguard. IDS Security Systems Ltd are based in Cardiff, but we install fire protection systems across South Wales as well as in some parts of England. To arrange a site visit or request a quote for your addressable fire alarms, call 029 20 753 251 or contact us online today.